Cooking oil for frying, enough to cover half-way up the sides of piroshkies. Mix warm water with yeast, stir to combine and let sit for about 5 to 10 minutes, until turns foamy. Place flour, salt and olive oil in a large mixing bowl. Make a well in the center, and add yeast water into the well. Mix the dough with your hands, and knead until the dough forms a ball and does not stick to the bowl anymore. Transfer the dough into an oiled bowl, cover and store in warm place until double in size, about 1 hour. Meanwhile, heat the oil in a large skillet over medium heat. Add ground beef and cook until evenly brown. Drain and discard the excess liquid from the skillet. Add onion, garlic, dill, and mushrooms into the beef, mix well and continue cooking until done. Add sour cream, season with salt and pepper. Remove skillet from the stove, cool down to room temperature before using. Take the dough out of the bowl and transfer to a lightly floured surface. Divide dough into 16 equal parts. Roll each piece of dough into a small disk, about 4 inches in diameter. Place a heaping tablespoon of beef filling into the center of the disk, gather the edges and firmly pinch to seal. Repeat the process until all of the ingredients are used. 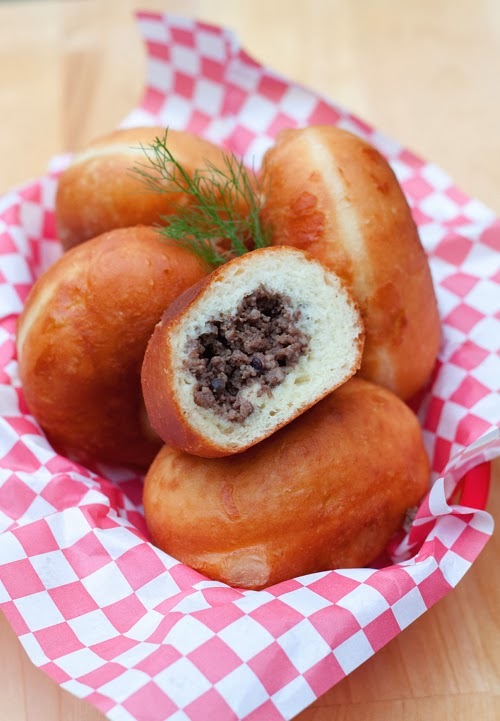 Arrange piroshkies on a floured cookie sheet and let them rest for about 10 minutes. You don't need to hold on to the same old custom ringtone of your windows 10 phone and instead of that you can get a better and ringtone of your own choice by this online tutorial add custom ringtone in windows 10. You can find the related details on this site too .